Ever wanted to see whats going through Squid’s cache right at the moment? But get immediately discouraged with all the timestamps, SWAPOUT, RELEASE and other cache variables? I have a one-line for you! alias squidcache="tail -f /var/log/squid/store.log|grep -oE '\b(http?)://[-A-Za-z0-9+&@#/%?=~_|!:,. ;]*[-A-Za-z0-9+&@#/%=~_|]'"
Or simply run as-is for whatever reason.. 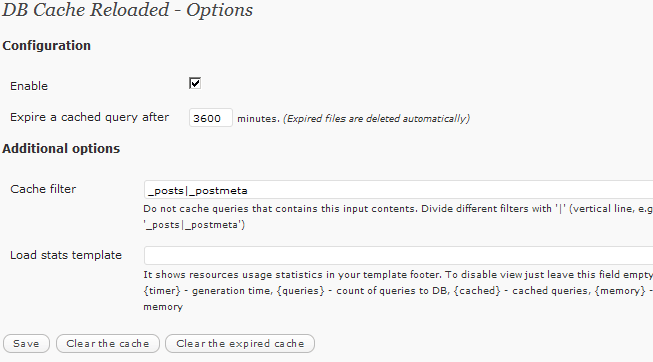 I have tried a number of cache plugins for wordpress, but DB Cache Reloaded has been the best one so far. It caches SQL database requests rather than whole pages, which is how WP Super Cache works, using less memory. This plugin CAN be used with WP Super cache if you really want to, but i don’t recommend it. DB Cache Reloaded is actually an improved version of the previous just “DB Cache”, I think the reason for the new version is because of that the creator stopped supporting and developing the plugin.